Thank you for signing up to Tiger Trading. A confirmation link has been sent to your email. Click the link in the confirmation email to create your account. Traders have accounts at multiple locations, but they have to access each one independently - there is no single access point. Crypto asset markets are fragmented, with massive disruptions to client orders, poor information and no transparency. Retail Traders have been left out of the current discourse surrounding the future and scope of digital asset trading. With over 30 million blockchain wallet users worldwide, 25 million users at some of the biggest exchanges alone, billions of dollars traded on a daily basis and new accounts being opened daily, there is a growing need for the proper infrastructure, global connectivity, aggregation, single points of access and security. 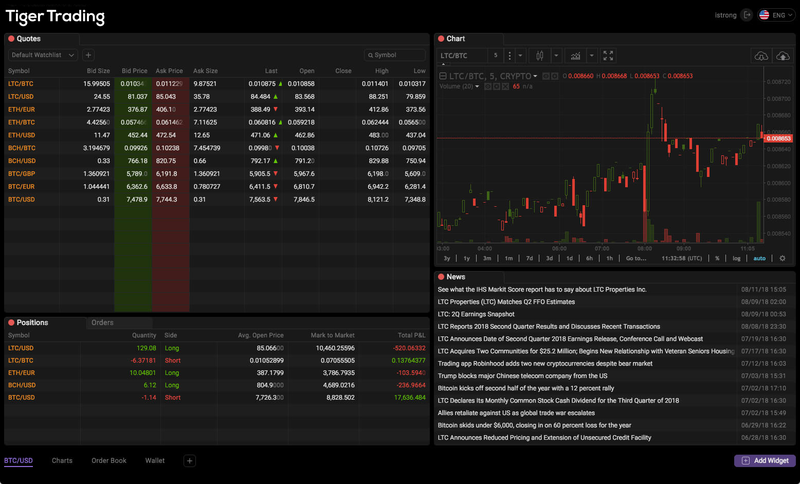 With the Tiger Trading OEMS, traders will be able to send orders, receive market data, have a state of the art HTML5 front end, several API choices and the ability to route intelligently through one service. Tiger Trading Network LLC sibling, Tiger LLC, is trusted worldwide in various existing applications, including US based, FINRA and SEC regulated equity ATS’s and some of the world’s largest global equity exchanges. The Tiger Trading management team is comprised of experienced, successful and passionate entrepreneurs who have successfully driven startups in both the cryptocurrency space and traditional financial markets. They have built and operated world class and innovative trading systems and have tremendous depth in all asset classes, derivatives, trading and analysis. These systems have low latency and high throughput using multicast technology. Our engineering team is expert in complex trading systems, middle and back office software development, web development, interface and design and mobile development. Tiger Trading is designed to serve all global traders in the crypto marketplace. Everything is hosted online, there is nothing to install. Operating as PaaS (Platform as a Service), Tiger Trading gives traders the power to bring all the liquidity into one place and then trade wherever there is best execution. The retail customer is disadvantaged when trading on global crypto platforms. They are subject to market manipulation, spoofing, front running and orders moving away from their stated interest. In fast and volatile markets, there are discrepancies between the various major exchanges and challenges to get best execution. The nascent institutional market, which has yet to fully embrace the crypto market, often because of these same issues and the liquidity impact, have the ability to trade with the world’s largest OTC desks. This is not available to the individual trader. For this reason, Tiger Trading has built and will be the first to market with an OEMS that is designed to serve retail customers. OTC desks are in the business of servicing their clients as well as making markets on large trades. 100 BTC or more is not uncommon and as such, they need access to the market’s global liquidity and exchanges. Some may have their own algorithms and connectivity to the world’s exchanges and can best execute their order flow, while for others it is essential to have the same access, algorithms and speed as the more advanced brokers. As Sales Traders become more involved in the ecosystem, client order flow, record keeping and execution can be managed with Tiger Trading technology. There are nearly 200 hedge funds dedicated to trading crypto currencies and other crypto assets. They employ many different strategies (algorithmic, quantitative, long/short, etc.) 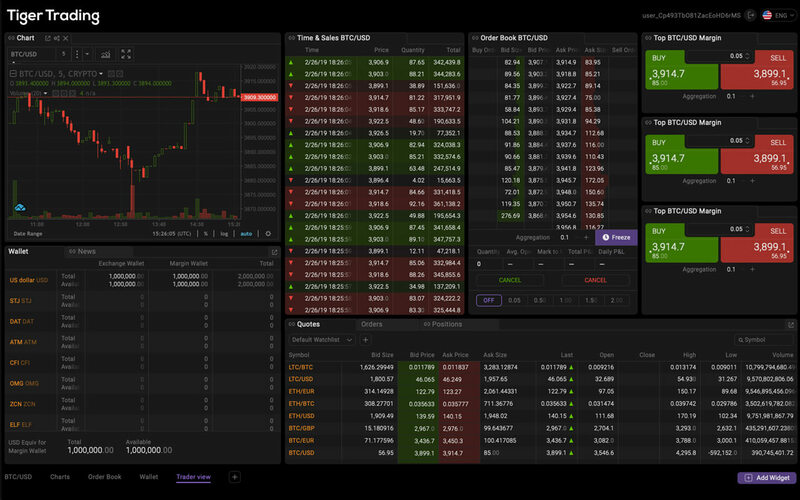 and most if not all have accounts on multiple exchanges. They need best execution and access to wherever they trade. There are currently about 200 exchanges globally, many of whom are newer, younger than some of the more established platforms. There are new business models and products being offered and very importantly, this market is always evolving and changing, with new products and solutions constantly coming to market. Tiger Trading is committed to working with these exchanges to help bring flow and distribution. We feel this is an especially strong attribute of ours because we have the ability to scale and adopt to these new products and solutions, whether it’s futures, options or new securities. Our OEMS is capable of working with any bespoke solution. OEMS for retail traders, buy side traders and OTC brokers as well as connectivity into liquidity pools. Operate as a pure SaaS and PaaS. Credit and Clearing Facility - Solutions and Services. Provide Limit Checks. Our pricing structure is and always will be the most competitive and cost effective for our clients. Security is foremost on our minds and we have a long track record of building the most secure and reliable systems. This is our commitment to our customers and the global community we will build together. In addition to the most competitive pricing structure in the marketplace, there are no IT charges, maintenance fees or any other hidden costs. We believe in transparency and always put the customer first.